In 2014, 54 % of the world’s population resided in an urban area and this is projected to rise to 66 % by 2050 (United Nations, 2014). It is also estimated that 90 % of people’s time in developed countries is spent indoors, either at home, at work, or travelling between the two (Klepeis et al., 2001). This equates to a lot of time spent indoors within an urban environment with the indoor and outdoor environments being strongly interlinked. well-being of the occupants (Vardoulakis and Heaviside, 2012). One part focused on flow behaviour in and around a building within a simplified urban environment through a full-scale field campaign which combined the methodologies of meteorology and engineering (Figure 1, Gough, 2017; Gough et al., 2018a; Gough et al., 2018b). The dataset spans nine months and is accompanied by wind tunnel (1:300 scale) experiments and CFD (Computational Fluid Dynamics) modelling to aid understanding (Figure 1, Gough et al., in review; King et al., 2017a; 2017b). 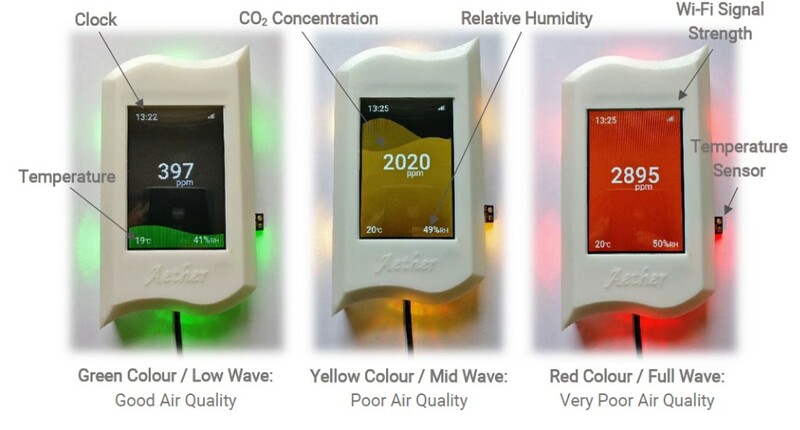 So far, it’s been found that two methods of measuring ventilation (tracer gas and pressure difference) vary depending on the external driving conditions (Gough et al., 2018b) and that natural ventilation is difficult to predict due to the interaction of wind direction, wind speed, temperature and turbulence, sometimes causing a dual local flow behaviour for a single reference wind direction (Gough et al., 2018a). For the pressure on the cube faces, current models capture it well for a single building, but do not capture the correct shape for a surrounded building, due to the unique features of the site not being accounted for (Gough et al., in review). This will have a larger effect, especially in more built up urban areas. Current work includes using the models created by the Dispersion of Air Pollution and its Penetration into the Local Environment (DAPPLE project)(Arnold et al., 2004; Dobre et al., 2005; Barlow et al., 2009) to predict local flow and testing existing models to predict natural ventilation rate against Refresh data (De Gids and Phaff, 1982; Warren and Parkins, 1985; Larsen et al., 2018). Focusing on human behaviour within offices, poor indoor air quality does not always equate to rational actions by office workers to improve conditions (Snow et al., 2016). This means that although a building may operate perfectly in design tests, when you include people, you find that they may work against the design! Shared offices often have a social hierarchy of people, with ‘Gatekeepers’ for window opening or thermostat control. By including devices such as the Aether (Snow et al, in prep) in the room indoor air quality is then socially negotiated. 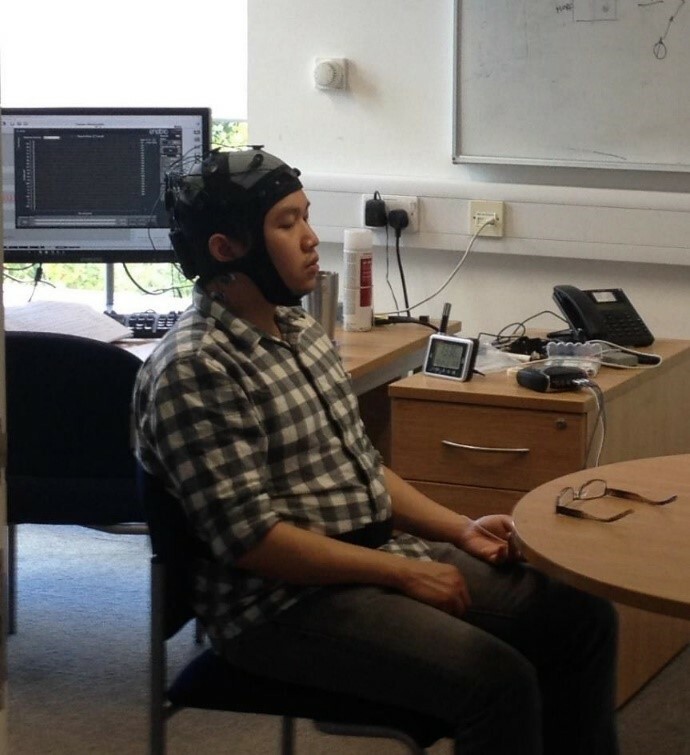 Figure 3: Participant undergoing the calibration procedure of the EEG studies into the effect of CO2 within a typical university office environment. A CO2 sensor is visible on the drawers with cognitive performance tests being undertaken on the computer. Tests using EEG (electroencephalogram) found a marginal effect of a 2,700 ppm CO2 environment (offices regularly reach this level) on executive function and the ability to sustain attention, regardless of the perception of the air quality (Snow et al., 2018) (Figure 3). This gives us the hypothesis that poor indoor air quality can impact cognitive performance prior to individual awareness. Looking forwards, we’re going to be working with the MAGIC project at their field-site in London (Figure 4) using Doppler lidar wind data and looking into the benefits of post-occupancy evaluations. De Gids, W., Phaff, H., 1982. Ventilation rates and energy consumption due to open windows: a brief overview of research in the Netherlands. Air infiltration Rev. 4, 4–5. Gough, H., 2017. Effects of meteorological conditions on building natural ventilation in idealised urban settings. PhD thesis. University of Reading, Department of Meteorology. Gough, H., Sato, T., Halios, C., Grimmond, C.S.B., Luo, Z., Barlow, J.F., Robertson, A., Hoxey, A., Quinn, A., 2018. 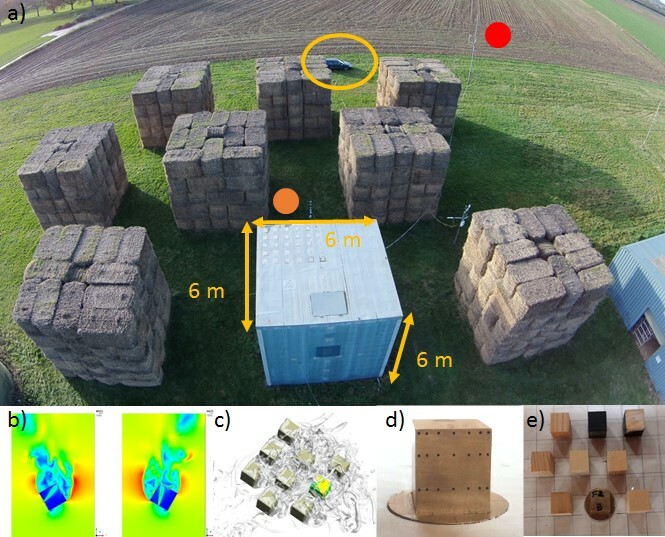 Effects of variability of local winds on cross ventilation for a simplified building within a full-scale asymmetric array: Overview of the Silsoe field campaign. J. Wind Eng. Ind. Aerodyn. 175C, 408–418. Gough, H.L., King, M.-F., Nathan, P., Sue Grimmond, C.S., Robins, A.G., Noakes, C.J., Luo, Z., Barlow, J.F., n.d. Influence of neighbouring structures on building façade pressures: comparison between full-scale, wind-tunnel, CFD and practitioner guidelines. J. Wind Eng. Ind. Aerodyn. Klepeis, N.E., Nelson, W.C., Ott, W.R., Robinson, J.P., Tsang, A.M., Switzer, P., Behar, J. V, Hern, S.C., Engelmann, W.H., 2001. The National Human Activity Pattern Survey (NHAPS): a resource for assessing exposure to environmental pollutants. J. Expo. Sci. Environ. Epidemiol. 11, 231. United Nations, 2014. World Urbanization Prospects 2014 revision (highlights). New York. Vardoulakis, S., Heaviside, C., 2012. Health Effects of Climate Change in the UK 2012. Warren, P.R., Parkins, L.M., 1985. Single-sided ventilation through open windows, in: Conf. Proc. Thermal Performance of the Exterior Envelopes of Buildings, ASHRAE, Florida. p. 20. For subsistence farmers in Africa, decisions on what variety of crop to grow, when to plant, and when to apply fertilizer are of life and death importance. The new TAMSAT* Agricultural Early Warning System (TAMSAT-ALERT) combines multiple streams of environmental data into probabilistic assessments of the risk faced by farmers when making these decisions. The assessments can be issued directly to farmers to support day-to-day decision making, or provided via drought warning bulletins from regional meteorological and agricultural organisations. TAMSAT-ALERT risk assessments can be based on any metric that can be generated from meteorological data. Our work has so far focused on meteorological and agricultural drought – encapsulated respectively by deficit in cumulative rainfall and soil moisture. Figure 1: Predicted cumulative rainfall anomaly for a location in Kenya for the 2000—2001 DJF rainy season. The forecast was carried out on 10th Decemeber 2000. 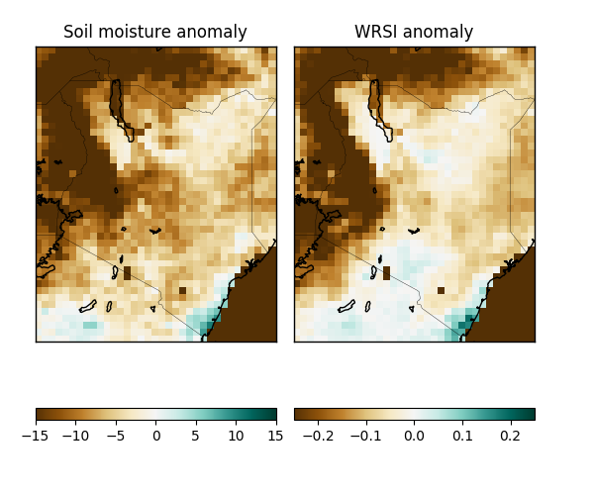 Figure 2: Predicted soil moisture anomaly (left) and Water resource Satisfaction Index (right) for the 2017 October-December rainy season in Kenya. This prediction was made on 1st December, 2017. TAMSAT-ALERT complements existing systems because it is sufficiently lightweight to be run on a standard PC, using the computing facilities available at African meteorological and hydrological services . Example outputs are shown in Figure 1 and 2. The system can be implemented both for detailed analysis at the individual community scale (Figure 1) and for regional/national level assessments (Figure 2). 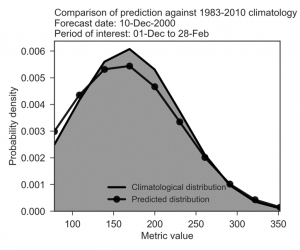 The national forecast shown in Figure 2, for example, took only ten minutes to generate. All the code for TAMSAT-ALERT is freely available on GitHub , and TAMSAT is working closely with African organisations to build their capacity to use the system. For less expert users, we are developing a web interface, which will provide a limited set of output plots for any point in Africa (Figure 3). Agricultural outcomes are affected by weather over an extended period, ranging from days to months. For example, low yield is caused by soil moisture deficit at critical periods during a ~ three month growing season; germination failure is caused by low rainfall during the two weeks after planting. The risk assessment on a given day, therefore, needs to take into account weather in the past and the future. In TAMSAT-ALERT, weather in the past is taken from observations, and an ensemble of future weather is derived from the climatology. Meteorological forecast information is integrated into the assessments by weighting the ensemble using probabilistic output from a numerical forecast model. This process is illustrated by Figure 4 and by the example above. A prediction of soil moisture deficit for the 2018 March-May growing season carried out on 1st April, will be created by driving a land surface model, such as the UK land surface model, JULES, with observations from 1st March – 1st April 2018 spliced together with data a 2nd April – 30th May climatology. 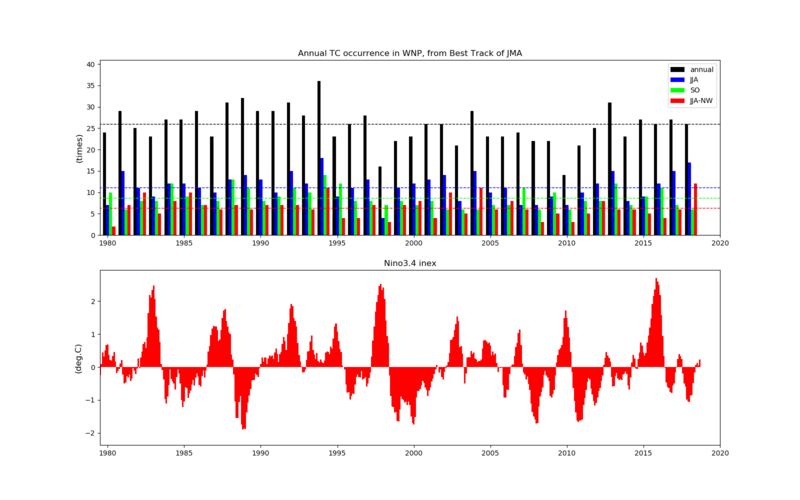 If the climatology is from 1983-2012, the ensemble will have 30 members. Ensemble member 1 will be yield output from the model driven with historical observations for 1st March – 1st April 2018, spliced with historical observations from 2nd April – 30th May 1983. The second member will use 2nd April – 30th May 1984 for the future period, and so on. The result will be 30 possible predictions of soil moisture – a frequency distribution. The next step is to integrate meteorological forecasts. In this year (2018), we have a prediction that the probability of regional MAM rainfall being in the lowest tercile is 60%, the middle tercile is 30% and the upper tercile is 10%. For example, if in 1983, regional rainfall was in the lowest tercile, the 1983 ensemble member is weighted by 0.6; if in 1984, rainfall is weighted by 0.1, and so on. 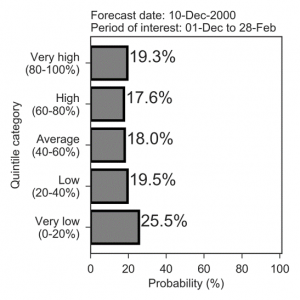 Probabilistic risk assessments are then derived by analysing this weighted frequency distribution. In essence, the system quantitatively addresses the question: ‘Given the state of the land surface, the climatology and the meteorological/climate forecast, what is the likelihood of some adverse food production event over the coming cropping period?’ As such, TAMSAT-ALERT is an ‘impacts-based’ forecast system, providing information aligned with the needs of operational food security risk assessments. TAMSAT-ALERT is run at the scale of the input meteorological observational data. It thus implicitly downscales and bias corrects regional seasonal forecast data. The system has recently been extended to run in gridded mode. Pilot projects confirm that the system is sufficiently lightweight to run in African agrometeorological agencies. *TAMSAT stands for Tropical Applications of Meteorology using SATellite data and ground-based observations. In the UK there are, on average, just 23.7 days of snowfall or sleet a year. However, precipitation in the form of ice crystals, or snowflakes, is an important feature within the atmosphere, both in the UK and worldwide. Research indicates that 50% of global precipitation events are linked to the production of ice in clouds, either falling as snow or melting as it falls to produce rain1. This percentage increases to 85% of precipitation events in mid-latitudes (including the UK) and 98% of precipitation events in Polar regions. The small ice particles formed in clouds precipitate slowly, at a much smaller velocity than large snowflakes falling in the lower atmosphere. However, this process must be represented within climate models as the precipitation of ice crystals determines the lifetime of clouds, which in turn impacts the atmosphere’s energy balance by, for example, reflecting incoming radiation from the sun. Unfortunately, ice crystals are complex 3D structures and we know very little about the aerodynamics of these particles since it is essentially impossible to study the precipitation of snowflakes as they fall through the atmosphere. Even studying snowfall at the Earth’s surface is challenging; natural snowflakes are small in size and have a tendency to break or melt when handled. Consequently, despite extensive field observation studies, many aspects of the aerodynamics of snowflakes are poorly understand due to a lack of detailed experimental data. New data on the aerodynamics of complex snowflakes is required to inform future microphysics schemes and remote-sensing algorithms that are used for weather prediction and climate modelling. Figure 1: Digital models of ice crystals commonly observed in different atmospheric conditions. (a-c) Planar crystals, of various forms, are prevalent at temperatures in the region of -15oC, (d) bullet rosettes are prevalent at temperatures in the region of -40oC, (e,f) aggregates of ice crystals form under a range of conditions, including in deep cirrus clouds and snowstorms. To overcome these challenges, the Remote Sensing and Clouds research group have adopted a novel laboratory-based approach, whereby 3D-printers are used to fabricate models of natural ice crystals. 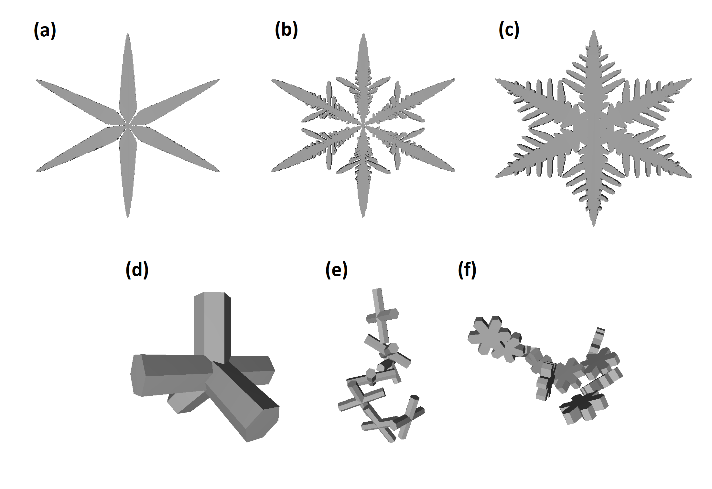 Having developed a “library” of typical snowflake shapes2, which form under different atmospheric conditions, the free-fall of 3D-printed snowflake analogues can be studied under controlled laboratory conditions. Examples of snowflake analogues used are shown in figure 1. Critically, this approach enables us to study complex ice crystal geometries, such as aggregates of ice crystals, for which comparable data is not otherwise available. Early work on this project3 provided data that support an existing model of the drag force that acts on falling snowflakes (described through a drag coefficient), which can be used to estimate terminal velocities of natural snowflakes. 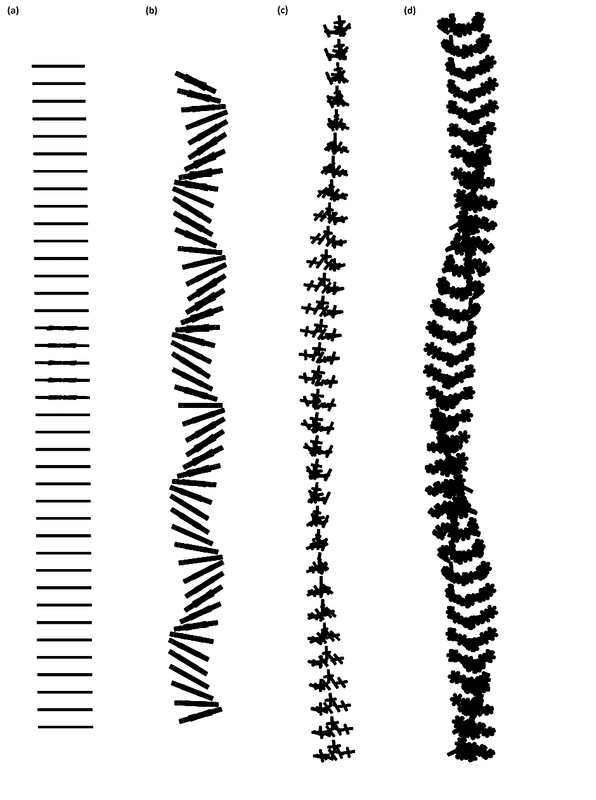 Figure 2: Digital reconstructions of the trajectory of falling snowflake analogues; a series of superimposed “snapshots” of each particle in free-fall are shown which illustrate the relative motion and orientation of the models. (a) Planar snowflake analogues with low mass (low Reynolds number) exhibit a steady free-fall with a stable orientation. (b) Planar snowflake analogues of greater mass (increasing Reynolds number) exhibit unsteady motions as they fall. (c,d) Aggregate snowflake analogues with an irregular geometry are routinely observed to rotate as they fall in a spiralling motion. Recently we have developed an experimental approach that enables the trajectory of the falling snowflake analogues to be digitally reconstructed by using images from a series of synchronised digital cameras. This new approach enables us to acquire more comprehensive data on the free-fall of snowflake analogues. In particular, these data enable us to quantify the orientation of the snowflake analogues and the unstable motions that they exhibit as they fall – typical examples are shown in Figure 2. These data will enable us to investigate the parameters that control the orientation of complex ice crystals and to improve models of the drag force that acts on ice crystals (in order to better estimate the terminal velocity of natural snowflakes with complex geometries). We hope to submit detailed results for publication later in 2019. Kikuchi, K., Kameda, T., Higuchi, K., Yamashita, A. 2013 A global classification of snow crystals, ice crystals, and solid precipitation based on observation from middle latitudes to Polar Regions. Atmos. Res., 132:460-472. DOI: 10.1016/j.atmosres.2013.06.006. Westbrook, C. D. Sephton, E. K. 2017 Using 3-D-printed analogues to investigate the fall speeds and orientations of complex ice particles. Geophys. Res. Lett., 44, DOI: 10.1002/2017GL074130. In the early hours of the 16th October 2017, an unusual storm made landfall in Ireland and continued to track north-eastwards, causing damage across the northern United Kingdom and Scandinavia over a two-day period. That storm – Ex-hurricane Ophelia – was the easternmost major hurricane (i.e., category 3 or higher) observed in the Atlantic during the satellite era (Figure 1). Ophelia had a tropical origin and structure and transitioned to an extratropical cyclone prior to landfall. It was not the first such ‘post-tropical’ Atlantic storm to make landfall in the mid-latitudes. To give just a few examples, Hurricane Lili (1996) hit the UK and Hurricanes Vince (2005) and Leslie (2018) struck the Iberian Peninsula. ‘Superstorm’ Sandy (2012) – the 4th most costly Atlantic hurricane on record – caused widespread damage across the Northeast United States. Figure 2: Interannual variability in North Atlantic post-tropical cyclones. 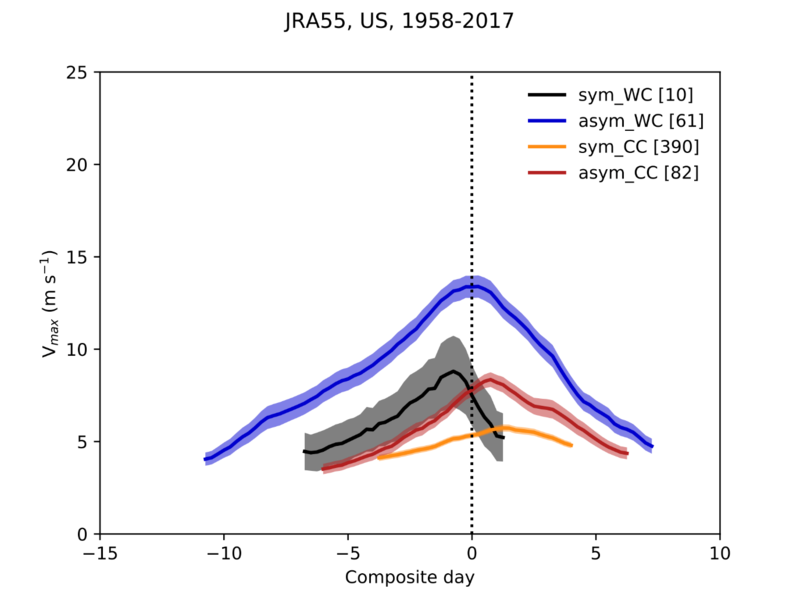 (left) Annual total post-tropical cyclone count timeseries for Europe (upper panel) and the Northeast US (lower panel) and (right) non-parametric (Spearman’s rho) inter-reanalysis correlation matrices (significant correlations, where p < 0.01, are in bold type). Post-tropical cyclones expose populous mid-latitude communities, which may lack the preparedness of regions more commonly struck by tropical storms, to hurricane-force wind speeds and extreme precipitation. The risk of such events is projected to increase in response to anthropogenic climate change because warming may induce poleward and eastward expansion of tropical cyclone genesis areas, allowing more storms to propagate to the mid-latitudes, where they may undergo extratropical transition and re-intensify (Haarsma et al., 2013). A quantitative survey of historical post-tropical cyclone variability – against which climate model fidelity may be evaluated and climate change projections put into context – is therefore required. 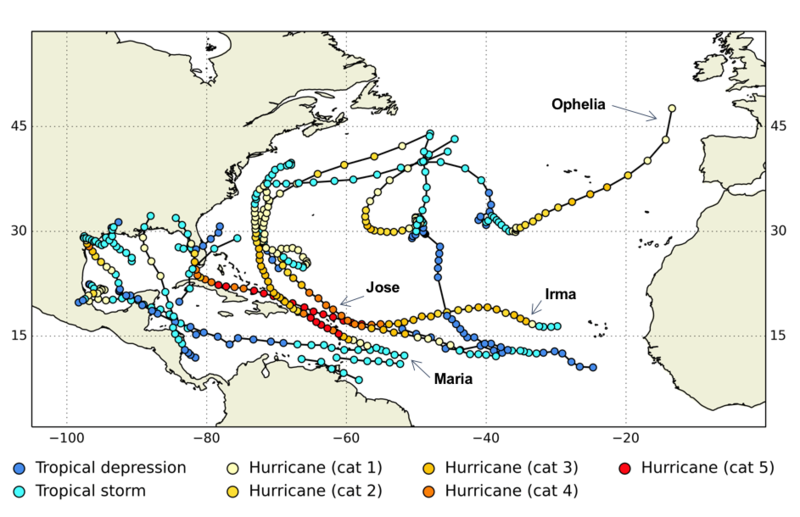 To understand historical post-tropical cyclone activity across the North Atlantic, we used an objective storm-tracking algorithm (Hodges, 1995) to identify post-tropical cyclones in four reanalysis datasets (ERA-Interim, JRA-55, MERRA2 and NCEP-CFSR). Here, we briefly discuss interannual variability in post-tropical cyclones, their intensity prior to and following landfall, and their associated precipitation, focussing on those systems which impact Europe and the Northeast US. So, what have we found? Let us first consider year-to-year variability. 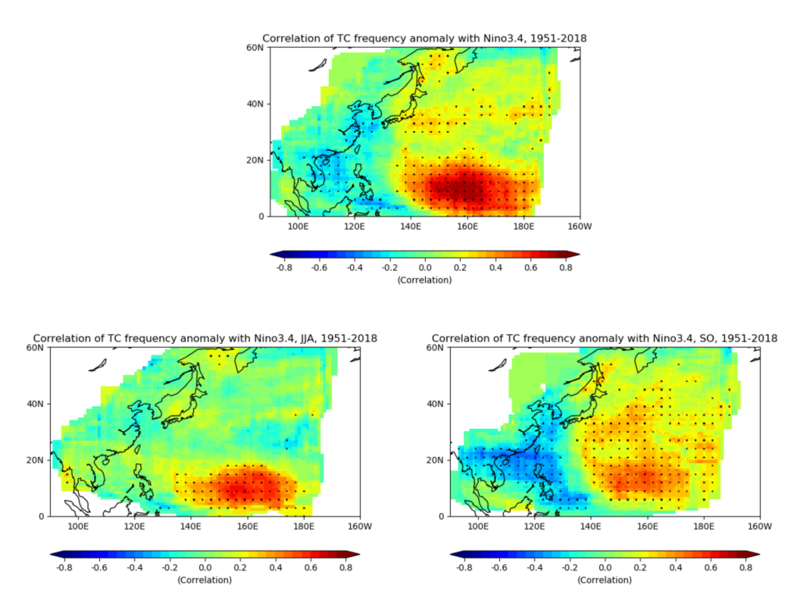 The reanalyses show no significant trends in total annual count of post-tropical cyclones impacting Europe or the Northeast US since 1979, although pronounced interannual variability exists (Figure 2, left). Overall, Europe and the Northeast US experience around five and ten post-tropical cyclones per year, respectively, including relatively weak systems. Interestingly, highly active Atlantic hurricane seasons, such as 2005 (the most active ever recorded), do not stand out as peaks in post-tropical cyclone activity. Moreover, there is little co-variability between Europe and the US: that is to say, peaks/troughs in Northeast US activity generally do not correspond with peaks/troughs in Europe. 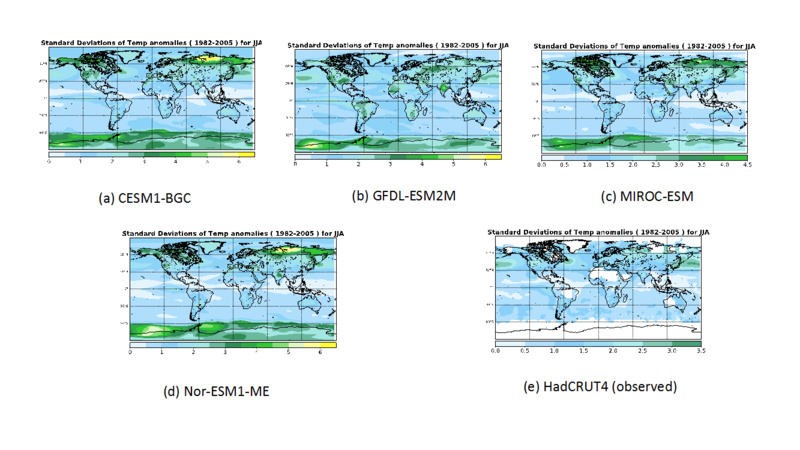 Inter-reanalysis correlations are higher for Europe than for the US (Figure 2, right), suggesting that the different model configurations and resolutions as well as the differing observational data assimilation schemes employed by the reanalyses impact the representation of historical post-tropical cyclone activity over the Northeast US more than that over Europe. Figure 3: Composite post-tropical cyclone lifecycles. Lifecycles of difference post-tropical cyclone types centred (i.e., where t=0) on landfall within the Northeast US. Legend entries: ‘sym’/‘asym’ = symmetrical/asymmetrical; ‘WC’/‘CC’ = warm-core/cold-core. Legend numbers give the number of cyclones in each Hart category. Shading shows one standard deviation. Example results for the Northeast US from JRA-55. We now turn briefly to storm structure and the two primary hazards posed by storms: wind and precipitation. Hart (2003) devised a way to describe cyclone structure and its evolution based on three parameters: cyclone symmetry and lower- and upper-level thermal winds. These parameters allow cyclones to be classified as warm- or cold-core and symmetrical or asymmetrical (frontal). Typically, tropical cyclones are symmetrical and warm-core; extratropical cyclones are asymmetrical and cold-core. Post-tropical cyclones exhibit these – as well as hybrid – structures. By classifying post-tropical cyclones in this way, we found that the majority transition to a typical extratropical structure, but an appreciable number retain structural aspects of their tropical origins (Figure 3). Crucially, warm-core post-tropical cyclones possess the highest wind speeds upon landfall. Figure 4: Post-tropical contributions to total precipitation. Average post-tropical cyclone precipitation contributions during August for the Northeast US (left) and Europe (right). TRMM precipitation observations are available up to 50°N and the black boxes outline the cyclone landfall domains within the domain of TRMM observational coverage (although both landfall domains extend north of this latitude). To establish the importance of post-tropical cyclones are for precipitation over Europe and the Northeast US, we sampled satellite-based precipitation estimates (from NASA Tropical Rainfall Measuring Mission) in the vicinity of each cyclone track and calculated post-tropical cyclones’ percentage contribution to the total precipitation. These contributions were mapped across our regions of interest (Figure 4). Post-tropical cyclones are responsible for up to 10% of Europe’s total summer precipitation. This is significant given that, on average, only a few such storms impact southern Europe and the Mediterranean each summer (Figure 2). Across the US East Coast, climatological contributions of up to 50% are seen in August, and contributions of up to 20% occur across New England and parts of southern Atlantic Canada. Collectively, these results highlight the contemporary importance of post-tropical cyclone precipitation. This work is currently in preparation for publication (Baker et al., 2018). We hope these analyses stimulate further discussion of post-tropical systems, particularly their tracks, tropical-to-extratropical transition, and representation in global climate models. Future work within the PRIMAVERA project will (i) perform comparisons with multiple high-resolution, tropical-cyclone-permitting global climate model simulations and (ii) assess the spread of post-tropical storm risk across the mid-latitudes under anthropogenic climate change. Finally, an exciting PhD opportunity in the Department of Meteorology, exploring this topic is currently open for applications, and more information is available here. I thank the EU Horizon-2020-funded PRIMAVERA project for financial support of this research and colleagues at the Royal Netherlands Meteorological Institute (KNMI) for helpful feedback. Rainfall is projected to change as the planet warms in response to rising concentrations of atmospheric greenhouse gases. New research indicates future changes in the timing and characteristics of the rainy seasons over Africa with important implications for impacts of climate change on vulnerable societies. The fourth IPCC (Intergovernmental Panel on Climate Change) Assessment Report (AR4) states that “Africa is one of the most vulnerable continents to climate change and climate variability”1. This is partly related to low capacity for adaptation across much of the continent but is also related to the high dependence on climate, in particular wet season rainfall. Most of Africa experiences one or two main wet seasons per year, when the majority of the annual rainfall occurs. For the large proportion of the population dependent upon rain-fed agriculture for their income and subsistence, the timing of this wet season and amount of rainfall is of high importance. Furthermore, wet season rainfall also impacts the recharge of reservoirs, the supply of electricity from hydro-power and the lifecycle of vectors (e.g. mosquitoes) responsible for the transmission of diseases such as malaria. It is therefore important to understand how future climate change will affect wet season rainfall across Africa. Figure 1: Schematic showing changes in timing of the wet season (left) and changes in seasonal rainfall totals (right). In a recently published paper, we use a novel method to investigate changes in the seasonal progression of rainfall across Africa. This methodology determines the start (‘onset’) and end (‘cessation’) of the wet season and is applicable across continental Africa. By applying this methodology to climate model simulations (RCP 4.5 and RCP 8.5 scenarios), we produced projections of changes in wet season onset, cessation, length and rainfall totals under future climate change (Figure 1). The projections show a delay in the onset of the wet season across much of western and southern Africa under future climate change. In regions where there is little change in the end date (‘cessation’, e.g. western Africa) or regions where the end of the wet season gets earlier (e.g. southern Africa) a later onset means the wet season shortens. This may be problematic for crops, as a shorter wet season can lead to a shorter growing season and result in crops not reaching full maturity. Across much of central Africa projections suggest that the amount of rainfall occurring during the wet season will increase. However, over southern Africa projections show lower rainfall totals. In such regions agricultural adaptation (e.g. to alternative crop varieties) may be required. The Horn of Africa (Somalia, southern Ethiopia, Kenya and Uganda) and equatorial regions experience two wet seasons per year; one in the Northern Hemisphere spring (known as the long rains) and one in the autumn (known as the short rains). Our results show the long rains ending earlier, and the short rains ending later. The most notable result, however, is the large increase in the amount of rainfall occurring during the short rains. We linked these changes in timing of the progression of the seasonal rainfall with changes in the summer heat low over the Saharan Desert (see paper for full details). Another important finding is that within the wet season rainfall intensity will increase, whilst frequency will decrease; heavier rainfall is damaging to crops with delicate flowers such as coffee and cocoa. In addition, long dry periods can reduce soil moisture and harden the surface layer; thus, when heavy rainfall events do occur a smaller fraction infiltrates into the soil and increased runoff leads to soil erosion and flooding. Overall, we found that future climate change will lead to changes in the timing of wet seasons over Africa, with shorter wet seasons over southern Africa. Seasonal rainfall totals are projected to increase over central regions, but decrease over southern Africa. Suitable adaptation may be required; for example, using crop varieties that can cope with a shorter growing season or altering farming practices to minimise soil erosion. Other adaptation may be required to protect crops from increasing intensity of rainfall. A secure, reliable and relatively affordable electricity supply is an essential part of modern life in many parts of the world. When charging an iPad, for example, one expects that power will be available at the flick of a switch and rarely considers the complex chain of events involved in producing and conveying the electricity to the device. The production of energy – including electricity – accounts for a large part of national and global greenhouse gas emissions. Decarbonizing the energy sector is therefore a key ingredient in meeting climate change targets both in the UK and worldwide. Electricity – widely seen as the easiest form of energy to decarbonize – has seen a rapid shift towards renewables, particularly wind and solar photovoltaic (PV). In a national-scale electricity system it is difficult to store large volumes of power efficiently and as such a near-instantaneous balance between supply and demand must be maintained. Thuswhile the growing use of weather-sensitive renewable generation is clearly beneficial in terms of reducing carbon emissions, it presents new challenges for electricity system management as electricity production cannot be controlled to the same extent as that from, for example a traditional gas-fired power station. This can be illustrated with an example. It has long been known that electricity demand is strongly sensitive to temperature: as temperatures fall in winter, electricity demand rises. Recent research, however, suggests that in the UK the impact of year-to-year variations in temperature via demand are now typically smaller than year-to-year variations in wind power supply (as shown in the figure 1). That is, in terms of the amount of electricity that must be supplied by coal, gas and nuclear power stations, the impact of a calm winter now exceeds a cold winter1 while winter-time weather patterns associated with both cold and still conditions lead to a double whammy (both high demand and low supply2,3,4). This suggest an important but subtle shift in how the weather risk should be viewed. To assess how much non-renewable generation capacity is required, it makes more sense to ask what the maximum demand-net-renewables is (i.e., the demand remaining once the contribution from renewables is removed). Such a calculation is easier than quantifying the minimum renewable generation available during times of peak demand (the so called “capacity credit” of renewables). The need for high-quality tools for assessing and understanding the impact of weather and a changing climate on the energy system has never been greater. 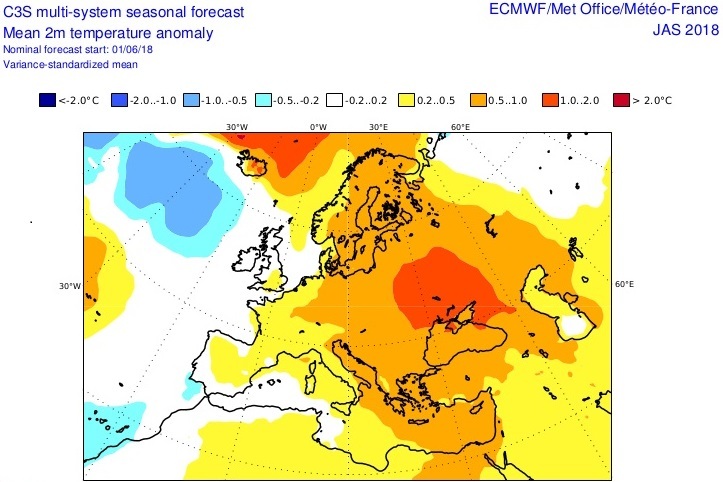 The Energy-Meteorology group5, working closely with its industrial and academic partners, is leading the development of many such tools: from the first use of multi-decadal “energy system data reconstructions”6, to the development of new European climate services for energy (weeks-to-months ahead7,8,9), and the exploitation of state-of-the-art high-resolution climate data for informing the design of climate-resilient power systems in the coming decade10,11. Bloomfield, H. C., Brayshaw, D. J., Shaffrey, L. C., Coker, P. J., Thornton H. E., 2018: The changing sensitivity of power systems to meteorological drivers: a case study of Great Britain. Res. Lett., 13 (5), 054028, https://doi.org/10.1088/1748-9326/aabff9. Thornton, H. E., Scaife, A. A., Hoskins, B. J., Brayshaw, D. J., 2017: The relationship between wind power, electricity demand and winter weather patterns in Great Britain. Res. Lett., 12 (6), 064017, https://doi.org/10.1088/1748-9326/aa69c6. Ely, C. R, Brayshaw, D. J., Methven, J., Cox, J., Pearce, O., 2013: Implications of the North Atlantic Oscillation for a UK–Norway renewable power system. Energy Policy, 62, 1420-1427, https://doi.org/10.1016/j.enpol.2013.06.037. Brayshaw, D. J., Dent, C., Zacharay, S., 2012: Wind generation’s contribution to supporting peak electricity demand: meteorological insights. Institution of Mechanical Engineers, Part O: Journal of Risk and Reliability, 226 (1), 44-50, https://doi.org/10.1177/1748006X11417503. Thornton, H. E., Scaife, A., Hoskins, B. J., Brayshaw, D. J., Smith, D., Dunstone, N., Stringer, N., Bett, P. E., 2018: Skilful seasonal prediction of winter gas demand. Environmental Research Letters. Res. Lett., (in press). C3S, 2018: European Climatic Energy Mixes. 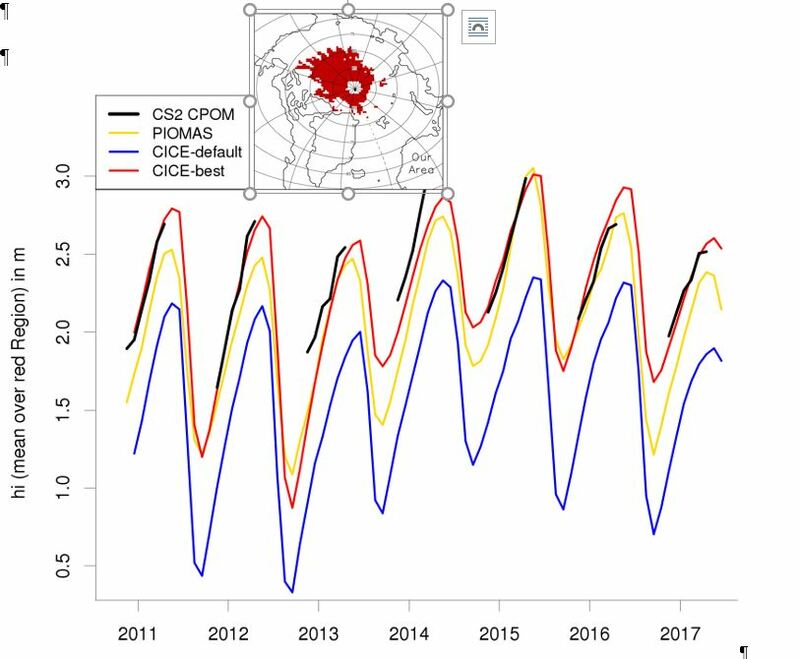 Accessed 6 December 2018, http://ecem.climate.copernicus.eu. Earth System Services, 2018: S2S4E Climate Services for Clean Energy. Accessed 6 December 2018, https://s2s4e.eu. Santos-Alamillos, F. J, Brayshaw, D. J., Methven, J., Thomaidis, N. S., Ruiz-Arias, J. A., Pozo-Vázquez, D., 2017: Exploring the meteorological potential for planning a high performance European Electricity Super-grid: optimal power capacity distribution among countries. Res. Lett., 12 (11), 114030, https://doi.org/10.1088/1748-9326/aa8f18.